From our FV contributor, Gudy Herder of Eclectic Trends who is based in Barcelona working as an Interior Stylist, Trend Observer and Trainer. 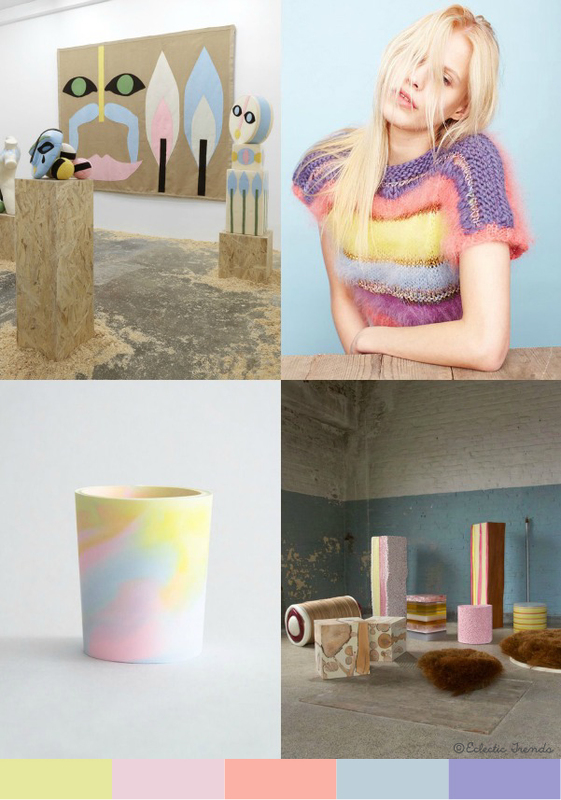 Her website Eclectic Trends is full of interior and trend inspirations, http://eclectictrends.com. 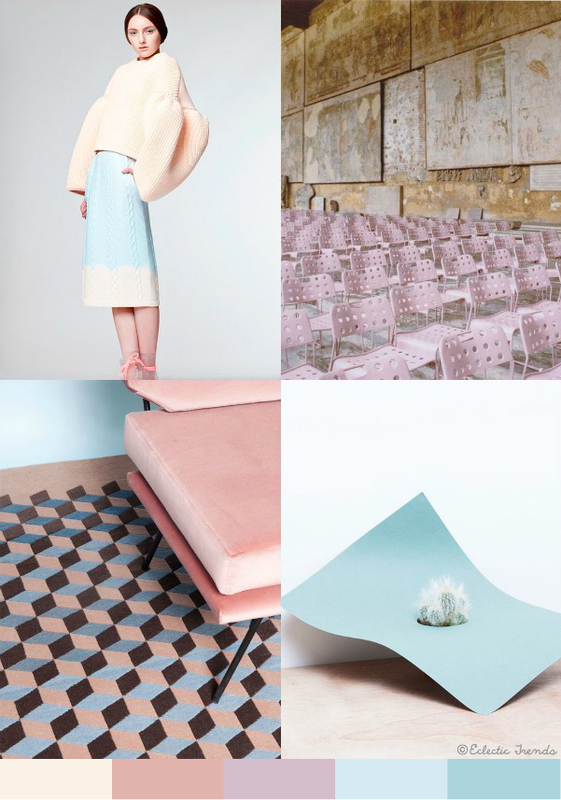 Here is her latest S/S 2015 color trend and you can view the entire report here. I have recently deleted my pastel color board on Pinterest with pins gathered since 2013 since I felt it was quite dated. But to my surprise pastel colors are on rise again. They were really huge a couple of years ago, and you find today two pastel trends which are a) a more velvety powder look and b) vivid pastel colors. The main difference is two new colors which are geranium and lavender (the corresponding Pantone codes are linked) you see in this first grid(#3 and #5). 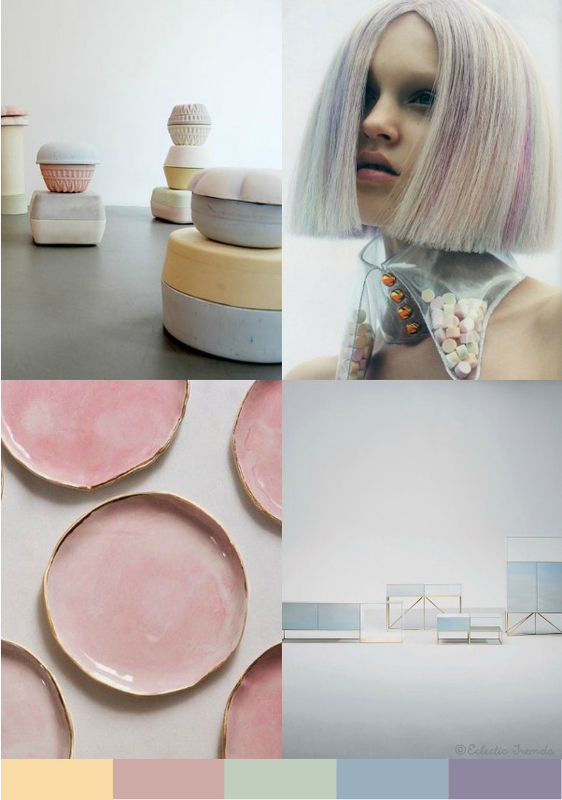 This color trend has been eventually called Soft Pop and is forecasted with similar images for S/S 2016 by other great experts such as WGSN. I do see the candy colors already for this year and believe they are still actual next summer with probably a slight move towards more vivid tones. This season they are still pretty chalky (if you search for a nice chalk paint brand, try Auténtico - the color palette is really beautiful) and often muted. 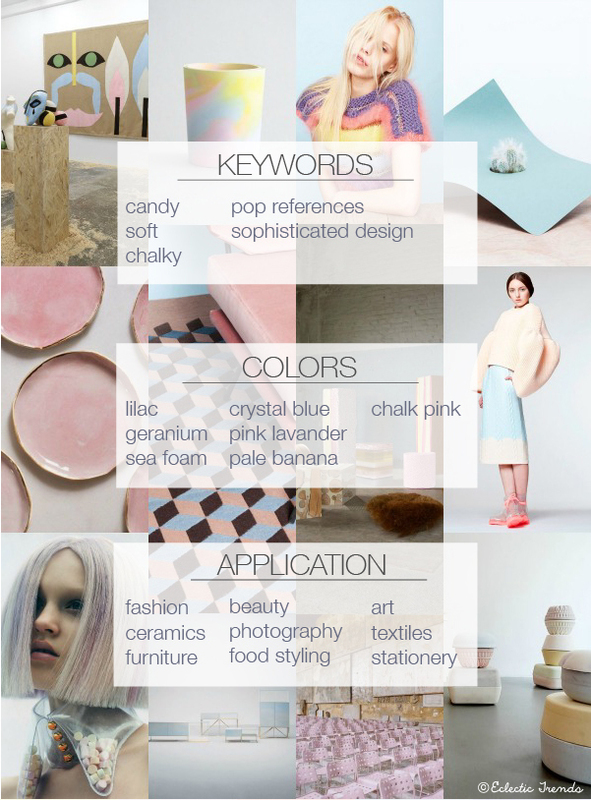 What makes this trend so interesting is the fact that these colors are applied to pretty much any creative field. I have stated on the keywords sum up nine of them but could easily add another three like flower styling, hair (beauty would the then refer to cosmetic only) and jewelry. Pastel colors used to be applied to rather playful designs often with a touch of humor or even created with a pretty kitsch approach. But the change towards a much more sophisticated design is probably the major novelty here. Pastel colors started already getting more ‘mature’ last year when paired with a neutral background, different shades of gray or even black (that would be a different post though). What is really huge are pastel hair braids, wigs and anything around pastel-colored hair. Sign up for the newsletter if you don’t want to miss a new trend post. 50% of the content is for subscribers only.